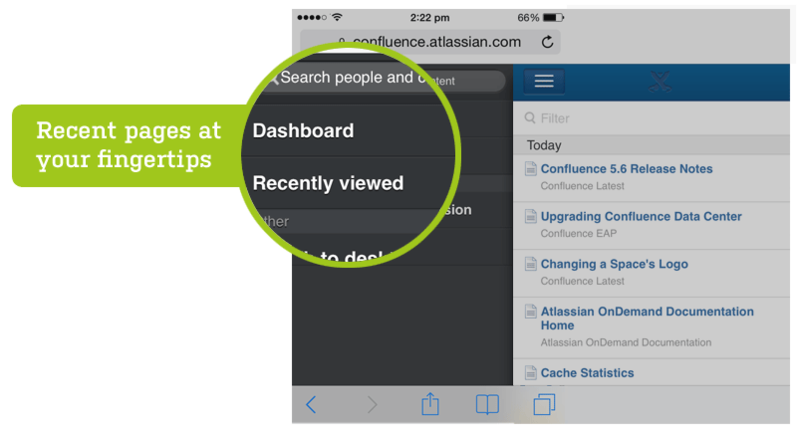 With great pleasure, Atlassian presents Confluence 5.6. 10 features and improvement requests fulfilled. More than 1290 votes satisfied. 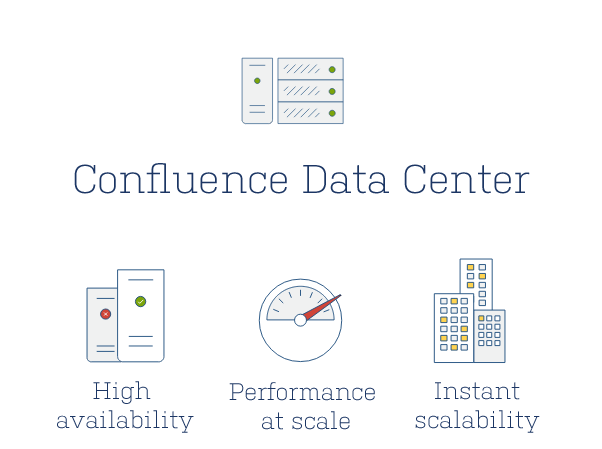 To provide performance at scale, high availability and instant scalability in large Confluence installations, we're pleased to announce Confluence Data Center, our new solution designed specifically for Enterprise. Is your organization growing? Confluence Data Center spreads the load evenly between clustered nodes, processing more requests than a single instance. Put simply this means that more people in your organization can use Confluence while maintaining performance. Licensing is based on users, not the number of nodes in your cluster, so you can join additional nodes to your cluster at any time. Confluence Data Center grows with you. Is Confluence mission critical in your enterprise? With Confluence Data Center if a cluster node is shut down, fails, or is disconnected from the network the rest of the cluster will continue operating - as long as one node remains. The only time you should need to bring down your entire cluster is to upgrade Confluence itself, allowing you to keep your organization humming, and your teams productive. Confluence Data Center requires a separate license, contact us if you're interested in trying it. Interested in the technical details? Read more in our Enterprise documentation. 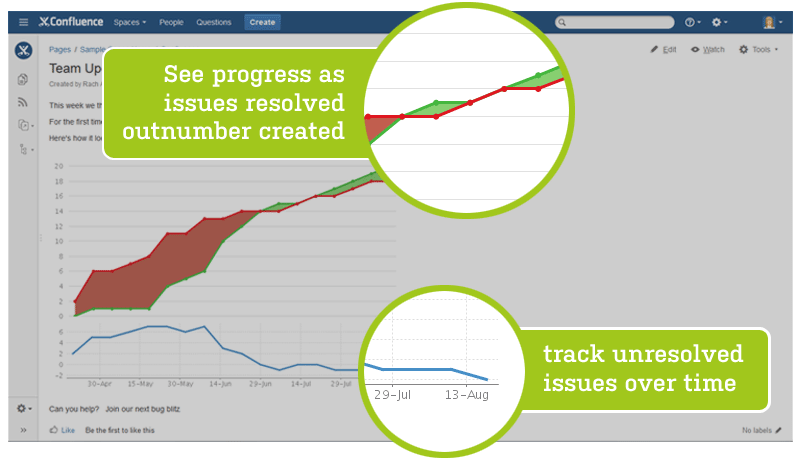 If you use JIRA and Confluence together we have two brand new chart types for the JIRA Chart macro that help you see progress against your backlog and provide better transparency of your team's work. Are you making progress or losing ground in your project? 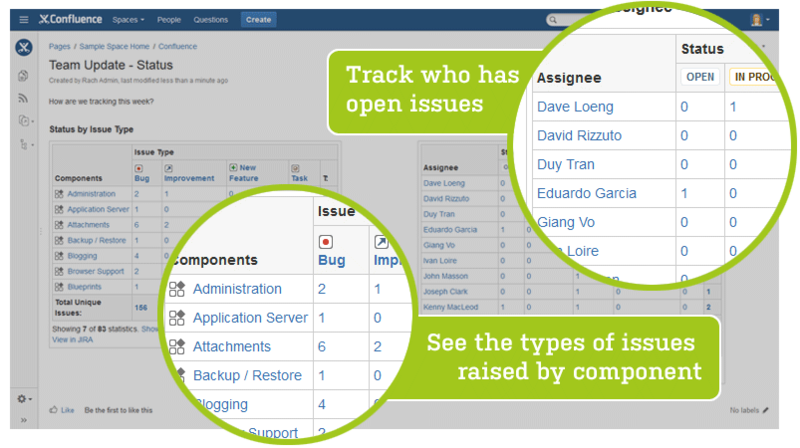 Now you can get a clear view of your team's progress, without leaving Confluence. See the difference between the number of issues created and the number of issues resolved over a given period of time with the Created vs Resolved line chart. Go to Insert > JIRA Chart > Created vs Resolved to try it. the priority of issues in each component (component vs priority). You can configure both the X and Y axis to show issue status, priority, type, assignee and more. It's completely up to you. Go to Insert > JIRA Chart > Two Dimensional Chart to try it. By popular demand, you can now restrict blog posts. Restrict blog posts is perfect when a blog post is only relevant to a specific group or team, or when confidentiality is important. Note that notifications on new blog posts are sent at the point a blog post is created - removing restrictions won't trigger a new notification. Tired of waiting for long pages to refresh every time you add or edit a comment? Confluence now posts your comments instantly, without refreshing the page, so it's easier to discuss pages with your colleagues. Starting in 5.6 you can now access your recently viewed Confluence pages from your mobile device. Tap then choose Recently Viewed. "Recently viewed" is synced across all your devices so from your mobile you can quickly access a page you were previously viewing from your laptop. Sorting in the Task Report macro has been improved. There is now a Sort parameter that can be used to set the default sort order of Tasks (by due date, assignee or page title) and you can also sort tasks using the Task Report column headings when viewing a page. With Confluence 5.5 you could insert a date lozenge by typing // into the editor. Now we've added natural date recognition so you can type dd/mm/yyyy or dd-mm-yyyy to trigger the date picker. For example 31/12/2014 will convert to 31 Dec 2014 . The sidebar now defaults to show the page tree when you create a new space. You can easily switch between Page Tree and Child mode, just go to Space Tools > Configure Sidebar. We've also improved the space logo uploader to make it easier for you to resize and centre your images. Go to Space Tools > Configure Sidebar to edit the space logo. We have improved the way emoticons, JIRA issues and tables render in PDF exports. The Office Connector now supports displaying, editing and importing Office 2013 documents. There are some browser and operating system limitations, so be sure to check the Office Connector Prerequisites page for details. System Administrators can use the new lightweight monitoring console to monitor page and macro execution times. Go to > General configuration > Monitoring console. You can now configure a mail server with TLS authentication (such as Gmail), right from the Confluence administration console. We're consolidating the capabilities we currently have in multiple different APIs into a single, easy to use REST API. Over the next several releases we will be deprecating our existing APIs as equivalent resources are made available in the REST API. In this release we've focused on content properties. See Confluence REST API in our developer documentation for more details. Plugin developers: see Preparing for Confluence 5.6 for changes that may affect your plugins and to find out how to mark plugins as cluster compatible on Marketplace.